Infinix Mobility Nigeria announced its Valentine’s campaign last week, which has been trending on Social media. Infinix Nigeria wants to help single’s find their ideal BAE via the campaign themed #Findurbae. The campaign started on the 28th of January and will end on the 10th of February before Valentine’s Day. Infinix will pair 50 people into couples and treat them to ‘A romantic Valentine’s Dinner in Lagos’. Couples paired in Abuja, PH, Warri and Ibadan will be treated to ‘A Movie Date’, which will both take place on Valentine’s Day, 14th of February 2018. In the spirit of the season, Infinix is also rewarding Infinix Note 4/Zero 5 customers during the campaign. Customers will automatically get special gift items when they purchase any of these phones at Infinix partner stores. Participating stores in Lagos are SLOT, MSL, Spar, Finet, SMAT, 3CHUB, DC, Spectrum and Effect Network. In Port Harcourt partner stores include SLOT, Callus Miller, Finebrothers, JJ Phones, Spar, Avis, Finet, Cee2cee, Givers, GOFE World and Kometech. 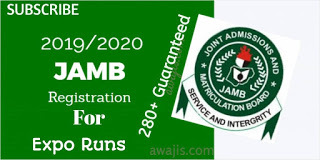 In Abuja partner stores include OMA, Plan A Emab, Phones and Data, Achisco Sheriff, SLOT, Givers, Alada phones and 3CHUB. In Warri partner stores include 3CHUBM, Rejiwdo, N-G Computers, Onix, Christphil, Raycom, Blesslaw, NG Computers, Jonny GSM, Bibi Ventures, Eboka, Pointek, Odico and Finebrothers. In Ibadan participating store include La Place, Top Success, Play, Solat, Phone Station, Micro-Station, Al Arash and Harmony. 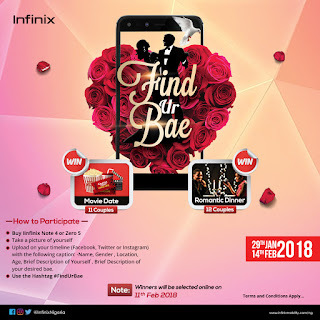 0 Response to "#Findurbae and win a romantic treat, special gift items when you purchase Infinix Note 4/Zero 5 this Valentineâs"